Since 2005, YouTube.com has become an undeniable powerhouse of internet content sharing. Despite its humble beginnings as a simple side project by a trio of ex-PayPal employees, the website– later bought out by Google– has transformed into an enormous force within modern culture. Standing as one of the major hubs of the internet, YouTube is a massive corporate entity which sits at the crossroad of countless legal issues. Recently there has been a rising interest in questions revolving around copyright and YouTube’s role as a content regulator. There are many questions worth asking, but this post will focus on one which has been at the forefront of discussion: what responsibility does YouTube have to remove copyright infringing content from its website, and what methods should they be expected to employ? It’s a question that isn’t so easy to answer, especially considering just how big YouTube truly is. Since its inception in 2005 and Google acquisition in 2006, YouTube has experienced astronomical growth, boasting over 1.3 billion unique users. While most users simply watch videos as opposed to posting any themselves, the number of uploads remains astronomical. YouTube hosts so much content that it’s difficult to conceptualize the sheer magnitude of data on the site. To give some idea of the scope, recent estimates claim that over 300 hours of video are uploaded to YouTube every 60 seconds. The vast amounts of data bring about valid concerns about how possible it is for YouTube to regulate uploads at all. With so many videos being posted every hour of every day, it would take millions of employees to make even a dent in reviewing every single video for unlawful content. Even being a multi-billion dollar entity, YouTube still faces human limitations to regulating content. As a result, YouTube has turned to what many corporations see as the future – automation. In order to fight against users posting content they stole from other people, YouTube launched its “Content ID” system in 2013. The system works by allowing copyright owners to upload files with their original content. When the average user uploads a video to YouTube, it is automatically scanned against the database of copyrighted files. If there is a match, the original copyright holder is notified and may ask Youtube to issue a takedown. While the system works well for incidents such as unlawful uploads of entire movies or television episodes, Content ID has met hostile criticism from those who argue that it allows big copyright holders to abuse their protections against small creators. Since implementation of the Content ID system, there have been numerous complaints from creators of original content on YouTube who have had false copyright strikes put against their channel. There have been cases where videos with completely original content have been flagged for having the smallest similarity to something in YouTube’s Content ID database. 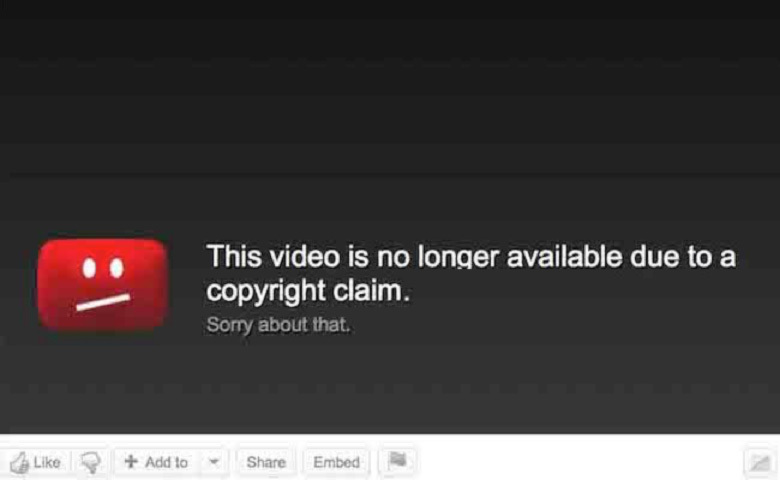 Many creators have also experienced their work being taken down despite falling neatly into Fair Use as a parody or review. The Content ID system, many argue, favors large corporate entities who can make even the most frivolous claims with hardly any ramifications. Though there is a process for YouTube uploaders to dispute a copyright claim, it is far from simple. If a content creator wants to dispute a claim, they face an uphill battle of convincing YouTube to take their side against an entity like 20th Century Fox or Universal. As one might imagine, most creators would rather take a copyright strike without a fight than to hire a lawyer. YouTube, responding to the criticism, has since made some changes to the Content ID system, including changing their policy which would stop creators from monetizing a video while a copyright dispute is in process. Allowing creators to make money while they dispute a bad claim is helpful, but the Content ID system still leaves much to be desired. Solutions to this problem aren’t exactly clear-cut. As stated, it just isn’t realistic to expect YouTube to hire people to manually review every single video posted on the site. Further, human review might alleviate some of the false alarms, but it could get messy when it comes to things that toe the line of fair use and infringement. Perhaps a more straightforward method would be to modify the Copyright ID system so that it only flags videos that have a substantial amount of content which matches something in the database. To supplement that, YouTube could look into going back to their old system before Content ID, where copyright owners had the burden of searching the website for infringing content themselves. Not a perfect solution by any means, but it is worth considering ways to level the playing field so that both big copyright holders and small time creatives can benefit from YouTube in a more equitable way. Student Bio: Kelly F. Vieira is a second year student at Suffolk University Law School. She is currently a staff member on The Journal of High Technology. She holds a Bachelor of Arts in Political Science from Tufts University.